Renewable electricity capacity is expected to reach 825 gigawatts worldwide by 2021. Global renewable energy deployments are set to grow at a much faster pace than previously anticipated, according to the International Energy Agency. Renewable energy resources accounted for more than half of the world’s new electricity capacity last year, overtaking coal in terms of installed power capacity. Record-level additions of onshore wind (63 gigawatts) and solar PV (49 gigawatts) drove annual renewable electricity capacity growth in 2015 to an all-time high of 153 gigawatts. 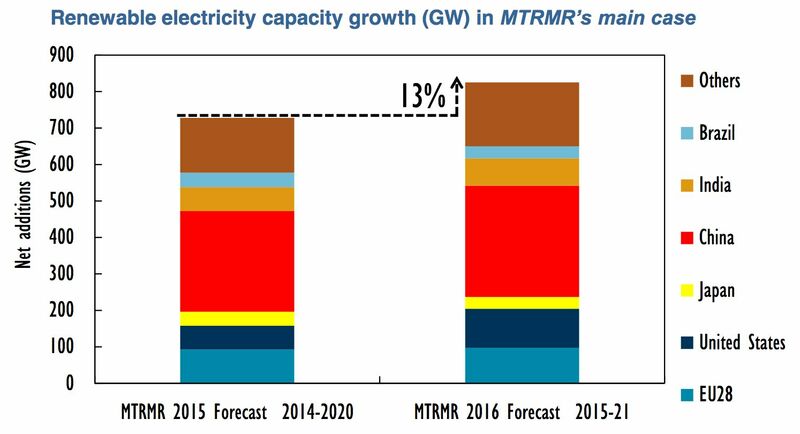 In the latest edition of the IEA’s Medium-Term Renewable Market Report (MTRMR), released yesterday, the agency upped its five-year renewables forecast by 13 percent, due in large part to stronger policies in the United States, China, India and Mexico. The report projects global renewable electricity capacity will increase by 42 percent, or 825 gigawatts, between 2015 and 2021. The new forecast stands in sharp contrast to IEA's previous reports. The 2004 World Energy Outlook predicted the share of non-hydro renewables in electricity generation would grow from 2 percent in 2002 to 6 percent in 2030. "Most of the increase will be in wind and biomass," the report stated. IEA said its latest revision was driven in part by cost. Last year saw record-low long-term remuneration prices ranging from $30 per megawatt-hour to $50 per megawatt-hour for both onshore wind and solar PV plants. 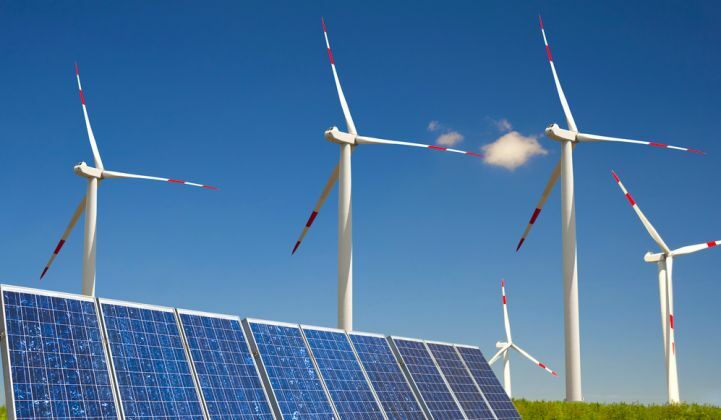 The new report forecasts onshore wind generation costs to decrease by an additional 15 percent by 2021, and for utility-scale solar PV to decline by an additional 25 percent by the same year. However, policy shifts were the primary reason for the IEA’s new projection. The U.S. alone represents nearly half of the forecast revision thanks to the extension of federal tax credits for solar and wind. With this policy change, the U.S. is expected to surpass the European Union to become the second-largest global market for renewable energy capacity additions over the forecast period. The IEA’s outlook is also more optimistic due to higher renewables targets set under China’s 13th five-year economic plan. China will remain the undisputed leader in renewable energy deployments, hosting more than one-third of global cumulative solar PV and onshore wind capacity by 2021. In India, ambitious government targets and competitive tenders (IEA notes that contract prices have already declined by a factor of two since 2014) are driving a more positive outlook. Mexico’s recent power-sector reforms and new auction system have also boosted expectations for medium-term growth. 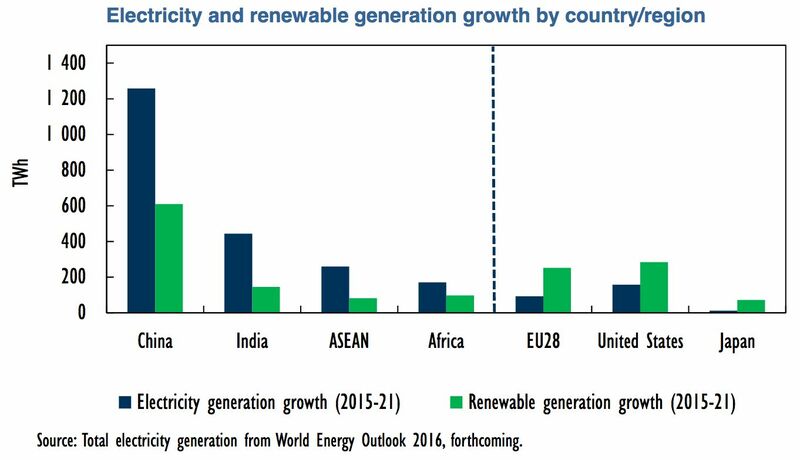 While renewable energy installed capacity is increasing rapidly around the globe, renewables growth as a portion of overall electricity generation will be more modest, increasing from 23 percent in 2015 to nearly 28 percent in 2021. Renewables are the fastest-growing source of electricity generation in the medium term, providing more than 60 percent of the global increase in electricity output over the next five years. Coal and other baseload fossil fuels will continue to make up the largest source of electricity generation, however, because solar and wind can’t produce power around the clock. The IEA notes this is a concern in the fight to address climate change. China alone is responsible for 40 percent of global renewable power growth, but that represents only half of the country’s electricity demand increase. So despite progress on renewables, the IEA questioned whether the world will be able to reach the targets set in the Paris Agreement. While solar and wind are on an upswing, even greater renewable energy deployments are needed to reach long-term global climate goals. “Meeting the objective of the COP21 global climate agreement to hold the increase in global average temperature to well below 2 degrees Celsius will require stronger decarbonization rates and accelerated penetration of renewables in all three sectors: power, transport and heat,” the report states. The Paris Agreement was signed by 197 countries last December and so far has been ratified by 86 parties. The next round of talks is set to take place from November 7-18 in Marrakesh, Morocco, where stakeholders will begin discussions on how to execute on the Paris Agreement guidelines. The IEA report includes an accelerated case projection that found global renewable capacity growth could be 29 percent higher than in the main case forecast if countries follow certain policy recommendations.